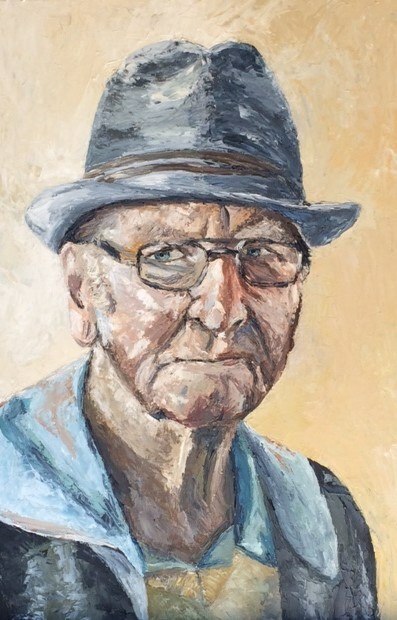 This is a painting I did of my father during the early years of his dementia. Painting this piece of art was so important to me as I wanted to hold onto a bit of the father I knew, the father that made sense, the father that spoke with understanding. This painting was a turning point in his journey with dementia. Shortly after the painting was completed he became bedridden and very confused. My name is Tara-lee Hollander. Although I am a self-taught painter and artist, I find my work progresses and grows through exposure to other artists, inspiring works of art and also through travel. Throughout my life art has been a part of me; it has even made up an important part of my earliest memories. Me drawing my own hands for lack of reference photos are part of these vivid memories. I love looking at the world around me and sharing that with others through my work. Interestingly, the beauty of the human body energizes most of my art efforts. The complexity of life and the intricate world of people are a never ending source of inspiration and influence on me as a creative.